When Frank Bigelow purchased the company in 1975, Specialty’s product line consisted of 16 hand tools that were manufactured and shipped from 300 sq. feet of warehouse space. Mr. Bigelow chose Niwot Corporation as the parent company and the Indian Head Logo to honor Chief Niwot, an Arapahoe Indian Chief who had befriended the early settlers that farmed in the Boulder Valley. Specialty quickly outgrew its space in Denver and moved to Longmont, Colorado. Today, Specialty Products is an ISO / TS 16949 certified company that supplies more than 1,200 parts to customers worldwide. Specialty Products has three different business units that are supported by two domestic facilities providing in-house development, manufacturing, sales and distribution. With world class customer service and tech support, along with advanced design and quality manufacturing, Specialty Products is your "Pro Alignment Team". SPC’s arm has improved clearance to get around the spring bucket. 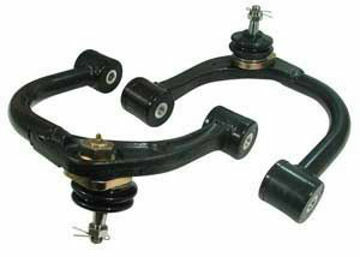 With 80° of articulation in the upgraded ball joint and free pivoting bushings, SPC's arm gives you maximum droop travel. 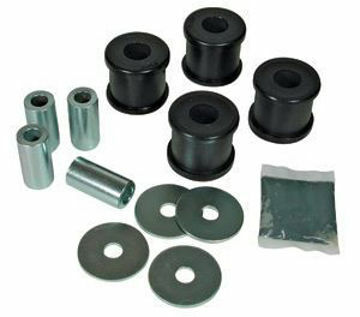 Bushing Replacement Kit provides superior performance and durability for your 25470/25480 Toyota Adjustable Control arms.